Drivers' needs and expectations are becoming more sophisticated, especially at the top-end of the car market. Increasingly, fast trackers, the primary target for Pirelli, require ultra-low profile tires with larger diameter wheels as well as higher tire load capacity. 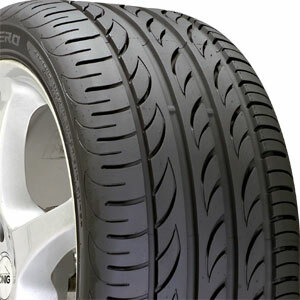 In line with its reputation for adapting quickly to market demands, Pirelli has introduced the P Zero Nero, a tire predominantly for the "soft" and "hard" tuning aftermarket, that takes its place in the P Zero Collection. P Zero Nero's slogan is "works harder, plays harder", derived from the tire's two major characteristics: �Driving Force The Extra Load capacity assists in maintaining the performance of both sports saloons with full equipment options and increasingly heavy and powerful tuned cars. New technology ensures a higher load carrying capacity without compromising driving comfort thanks to the adoption of a structure utilising new aramid fibre materials, thermally stable 0� nylon outer belts and more uniformly distributed stresses. �Driving Enjoyment A comprehensive range comprising many "pure" ZR sizes extends the limits of driving pleasure - no compromise dry and wet handling and powerful ABS braking with significantly reduced stopping distances. The exclusive styling and optimum safety features complete P Zero Nero's racing pedigree. These features not only make the P Zero Nero the ideal choice for tire/wheel conversions but add a new dimension to the car that reflects the drivers individuality.